Eric Sentell’s father pushed his son to figure things out on his own, even if it meant making mistakes along the way. As a result, he gained confidence and independence. He challenges parents today to stop running to their children’s rescue, and let them learn to navigate the world on their own. Parenting has been a very hot topic recently, largely thanks to Time magazine’s cover of a mom breast-feeding her nearly four year-old son. This aspect of “attachment parenting” may be the most shocking (and that’s a topic for another post), but it loses most of its shock when placed in the larger context of modern American parenting. Numerous writers, including Time’s Nancy Gibbs, have observed that many of today’s parents act like “helicopters.” They hover over their children and swoop in at the first sign of trouble. At a recent keynote address, Mark Taylor, an expert on generational differences, described 21st century parents as “bulldozers” who don’t even wait for trouble to arise. With Father’s Day approaching, I wonder if parents, in general, and dads, in particular, ought to function more like an “obstacle course” than a bulldozer. Parents demanded that nursery schools offer Mandarin, since it’s never too soon to prepare for the competition of a global economy. High school teachers received irate text messages from parents protesting an exam grade before class was even over; college deans described freshmen as “crispies,” who arrived at college already burned out, and “teacups,” who seemed ready to break at the tiniest stress. With few challenges all their own, kids are unable to forge their creative adaptations to the normal vicissitudes of life. That not only makes them risk-averse, it makes them psychologically fragile, riddled with anxiety. In the process, they’re robbed of identity, meaning, and a sense of accomplishment, to say nothing of a shot at real happiness. Forget, too, about perseverance, not simply a moral virtue but a necessary life skill. Quoting college administrators, counselors, professors, and researchers at length, Marano shows that these “psychologically fragile” students often struggle with anxiety, depression, eating disorders, binge drinking, and myriad relationship and academic issues. In his keynote, Mark Taylor cogently explained the evolution of bulldozer parenting. Parents in the “Traditional” generation—those born prior to 1945—criticized their kids’ talents in the belief that such criticism would increase their effort (an important value for those parents). When these children—the “Baby Boomers”—became parents, they reversed this paradigm in the name of boosting self-esteem. “Generation X” parents—born 1964 to 1985—perfected praising talent rather than effort. Now “Millennials” expect to succeed on talent alone, and their parents further instill that mindset by bull-dozing any obstacles to their kids’ success. And if the kid isn’t successful, then the bulldozer parent usually blames anyone but the kid. I was raised very, very differently, and I am reasonably happy with the results (if I say so myself; thanks, Mom and Dad). For one thing, I was praised for my effort rather than my talent. And before you think I was just talent-less, I did stand out intellectually and athletically in my (admittedly small) school cohort. But my work ethic was always highly valued by my parents, coaches, and teachers. When I reflect on my adolescence, one day in particular sticks out as a source of pride, self-reliance, and independence. I was a fairly new 16-year-old, and my vehicle needed a state-required safety inspection. I asked my father to take care of it, and he replied that I needed to do it myself. I knew a trip to a mechanic’s shop was in order, but I asked for recommendations. He told me I could go to any shop I wanted. When I arrived at a randomly-chosen auto shop, the mechanic pointed out that I had to get a new tail light before the vehicle could pass inspection. I asked where I could find one, and he suggested a salvage yard. So I drove to a junk yard and asked the proprietor for the specific type of tail light my vehicle needed. Without bothering to check his inventory, he claimed to not have it. I asked if he could double check. He said he was busy, but I could poke around for myself. So I dug through the cluttered storefront while he talked on the phone and helped other customers and eventually found the exact tail light that I needed. After my vehicle passed inspection, I asked the mechanic about the “Check Engine” light that had been brightly glowing for several weeks (notice I asked after the inspection). He had other inspections to complete, but he suggested asking one of his colleagues to check it out. I entered the shop’s storefront and bothered a mechanic who was on break. Shortly thereafter, I left the repair shop with a certifiably-safe vehicle and no intention of paying over a hundred dollars for a new catalytic converter. I felt—and still feel—an immense sense of pride for accomplishing all of this in a single afternoon with little to no guidance. I learned to take initiative and ask for help when I didn’t know the answer. I learned to persevere and seek solutions. I learned I could navigate the world on my own. And I learned all this from a pretty simple, inconsequential situation. A helicopter parent would have swept down to rescue me when I initially asked for help. A bulldozer parent would have cleared my path before I even asked. But my dad was indifferent in the best kind of way—the way that makes room for independent effort and the achievement of authentic self-efficacy. To paraphrase Hana Marano, taking ownership of the challenge (small as it was) helped me learn to forge “creative adaptations” to life’s vicissitudes, which in turn generated a healthy sense of accomplishment and confidence. Considering our emerging “Nation of Wimps,” I believe parents should go even further than my father’s indifference and actively create obstacles for their children. Let’s be honest, even in the midst of a recession and two wars, the vast majority of Americans have really, really easy lives compared to previous generations. We haven’t experienced anything like a Dust Bowl, grade inflation is rampant, and less than half a percent of Americans have served in the military. Given our affluence, our public schools’ mandate to guarantee success, and our volunteer-only military, the responsibility of producing strong individuals falls to parents. Fathers may have to shoulder most of this responsibility. In general, mothers tend to be more relationship-oriented and thus more nurturing. I don’t see most moms parenting as “obstacle courses” anytime soon, and I’m not even sure that they should. Children need support as well as challenges. Fathers, however, generally tend to have enough task-orientation to value and instill competency in those around them. They can allow their children to tackle life’s obstacles, absorb its blows, and dish back as good as they got. If necessary, they can even create a few obstacles—a refusal to complete a task; a challenge to “figure it out;” or maybe just, Heaven forbid, a few independent chores and responsibilities. 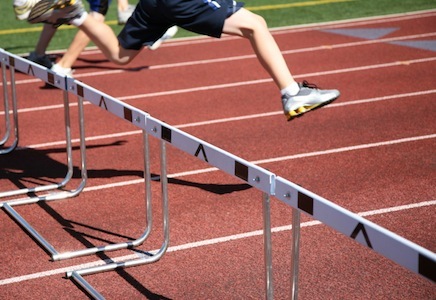 As Father’s Day approaches, let’s consider whether an “obstacle course” might be more beneficial than a bulldozer—and whether that “obstacle course” deserves some long-overdue appreciation. Eric Sentell lives in the D.C.-metro area with his emotionally brilliant wife. He teaches college composition and directs a writing center at Northern Virginia Community College. His short fiction has been published or is forthcoming in The Rivendell Gazette, Long Story Short, Red Ink Journal, Moon City Review, Unlikely Stories 2.0, Blink Ink Online, Short, Fast, and Deadly, and Six Minute Magazine. In September 2010, Long Story Short selected “Stolen Thunder” as its Story of the Month.